Park Forest, IL-(ENEWSPF)- Editor’s Note: Welcome to the first official reports of 2019 with more to follow soon. These police reports bring us through January 7, 2019. Charges for those cited during this period include possession cannabis, felony aggravated battery to a peace officer, two DUIs, and an accident where an entire wheel assembly was missing from a Hummer. Katrina P. Jones, 22, 272 Rich Rd., Park Forest, was issued a municipal citation on January 1 charging possession of cannabis after police observed a vehicle at 6:45 AM parked in the 200 block of Rich Road that had dashboard lights on but the vehicle was not running. An officer checked on the vehicle and discovered that a woman, later identified as Katrina Jones was sitting in the driver’s seat with her head slumped over the wheel. The keys of the vehicle were in the ignition but the car was not running. It took several minutes for the officer to wake up Ms. Jones, according to police. Another officer responded to the scene. One of the officers observed a small plastic bag containing a green leafy substance resembling cannabis, according to police. One of the officers requested Ms. Jones’ identification but she allegedly did not comply and tried to walk away from the scene, according to police, at one point attempting to lock the doors of the vehicle and walked inside the home. Due to her actions police placed Ms. Jones in handcuffs and advised her that she was being detained. Eventually, Ms. Jones was issued the municipal ticket charging possession of cannabis and released at the scene. Police turned the of keys to the vehicle over to a relative at the address in the 200 block of Rich Road. Lavyanna J.M. McCurty, 18, 6509 84th Court N., Brooklyn Park, MN, was arrested on January 1 and charged with two felony counts of aggravated battery to a peace officer after officers responded to the 2900 block of Western Avenue to assist the Park Forest Fire Department with a person who had just been involved in a property damage accident, according to police. Ms. McCurty said she had been dating a man from Illinois for about a month. The two had met on social media and she recently drove to Illinois from Minnesota to spend time with him. According to police, Ms. McCurty stated that she and the man got into an argument. She told officers, “I said I was going to hit his car but I was just joking around with him,” according to police. Police spoke with the man who provided video footage from his cell phone showing Ms. McCurty allegedly driving her vehicle into the man’s vehicle. Ms. McCurty did not possess a driver’s license through Illinois and only held an identification card through Minnesota, according to police. Police requested that Ms. McCurty perform field sobriety tests. According to the report, she smelled of an alcoholic beverage throughout the test. At the conclusion of the testing, her vehicle was towed per village ordinance and Ms. McCurty was transported to the Park Forest Police Department. The officer transporting her could smell a strong odor of an alcoholic beverage inside his squad vehicle, according to police. Ms. McCurty refused to perform a breathalyzer test at the police department. The arresting officer allowed her to make a phone call. The officer advised her that she needed to wrap up her phone call after several minutes. Ms. McCurty allegedly became enraged while on the phone and forcefully slammed the landline phone handset into the wall where the phone base was hung, according to police, breaking the base and the handset. Ms. McCurty then allegedly quickly ran down the prisoners’ cell hallway towards one of the cells screaming and making threats to harm herself. The arresting officer stepped into the hallway and began approaching the cell. The officer instructed her to go back into the cell at which time Ms. McCurty allegedly stated, “No! You’re going to have to make me.” Ms. McCurty then allegedly began advancing on the officer in the hallway at which time the two made physical contact with one another and the officer grappled with Ms. McCurty in an attempt to control the confrontation, according to police. The officer was able to get Ms. McCurty lowered near the ground into a position to wait as backup officers arrived to assist. At another point, Ms. McCurty banged her head once on the booking room wall. An officer pulled her off the wall to prevent her from any further injury. An ambulance was summoned to the Police Department to transport Ms. McCurty to St. James Hospital for treatment. An officer continued to hold onto Ms. McCurty’s wrist until paramedics arrived. Suddenly, Ms. McCurty turned towards the officer and allegedly spit on his face from less than three feet away, according to police. Two officers responded to Advocate South Suburban Hospital to seek treatment from the physical altercation with Ms. McCurty. One of the officers sustained a tear/overstretch to her rotator cuff muscle, according to police. Ms. McCurty was eventually processed on the two felony counts of aggravated battery to a peace officer and placed into a cell pending transport to the Markham Courthouse for a felony bond hearing, according to police. Robert J. Merck, 47, 16755 Paxton Ave., Tinley Park, was arrested on January 1 and charged with one count of driving under the influence of alcohol, one count of illegal transportation of alcohol, one count of improper parking/standing on the roadway, and one count of parking with an expired registration when police were dispatched at 9:51 PM to the area of 26th Street and Western Avenue to assist a motorist. SouthCom Dispatch advised police that a vehicle was stalled without any flashers or lights, facing southbound on Western Avenue. When police arrived, they observed that the vehicle had heavy right passenger side damage as well as heavy rear bumper damage. A set of car keys were in the ignition but the vehicle was not running and no one was inside the vehicle, according to police. At approximately 10:08 PM, officers received a call to perform a well-being check for a man wearing a blue sweater and blue warm-up pants who was walking southbound on Western Avenue. Police located the man, later identified as Robert J. Merck, one of the registered owners of the vehicle. Mr. Merck allegedly admitted to driving the vehicle left in the roadway on Western Avenue, according to police. Police could smell a strong scent of alcohol on Mr. Merck’s breath. Mr. Merck refused to perform field sobriety tests and was taken into custody on suspicion of driving under the influence and transported to the Park Forest Police Department. Mr. Merck’s vehicle was towed per village ordinance. Inside the vehicle, police located an empty 200 milliliter bottle of whiskey and a half empty 375 milliliter bottle of whiskey. Kelvin B. White II, 20, 190 Washington St., Park Forest, was arrested on January 2 and charged with obstructing identification and resisting arrest when officers were in the 100 block of Washington Street at 8:44 PM to investigate a 911 hang-up. Police saw a vehicle parked in that block with two subjects sitting inside of it. As one of the officers approached the vehicle, the passenger, later identified as Kelvin B. White II, exited the vehicle and immediately started walking toward a house in that block. The officer advised Mr. White to stop and he complied. The officer asked Mr. White to identify himself but he allegedly refused, according to police. Mr. White allegedly placed his hands in his pockets several times after being told by the officer to not do so, according to police. The officer asked Mr. White four more times for his name and birthdate before advising him that he would be placed under arrest on a charge of obstructing identification. Mr. White again allegedly refused. Officers then attempted to arrest Mr. White and advised him to place his hands behind his back. Mr. White allegedly refused, pushing and pulling away from both officers, holding his hands together in front of his body in an attempt to defeat the arrest, according to police. Officers eventually took Mr. White to the ground where he allegedly continued to resist by refusing to place his hands behind his back, according to police. 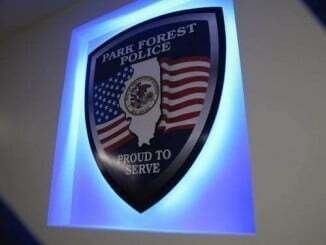 Police eventually placed Mr. White in handcuffs and transported him to the Park Forest Police Department. Tamika N. Bell, 44, 331 Merrimac St., Park Forest, was arrested on January 5 and charged with operation of an uninsured motor vehicle, driving while license was suspended, failure to display registration, expired registration, and illegal transportation of alcohol. Ms. Bell was further charged with one count of possession of methamphetamine less than five grams, a class 3 felony. An officer was patrolling at 7:34 AM on January 5, traveling southbound on Western Avenue. While passing Main Street, the officer observed a silver Ford Escape traveling northbound on Western Avenue that had no front or rear mounted registration, according to police. The officer conducted a U-turn and followed the vehicle which turned eastbound on Birch Street then eastbound on Choate Road. The officer caught up with the vehicle, activated the emergency lights on his patrol vehicle, and the suspect vehicle pulled into a driveway on Choate Road. The officer spoke with the driver, later identified as Tamika Bell, and apprised her of the reason for the stop. Ms. Bell told the officer that there was registration on the vehicle. The officer glanced toward the rear of the vehicle and located an Illinois seven-day temporary permit which was concealed behind the rear tinted window of the vehicle and was not visible from behind, according to police. A check of the registration showed that it had expired on January 4, 2019. The officer requested that Ms. Bell provide her driver’s license and insurance. Ms. Bell was unable to locate either but provided the officer with her full name and date of birth. The officer returned to his vehicle to conduct a LEADS inquiry on Ms. Bell. While walking back to his patrol vehicle, the officer saw a can of Coors Light Beer in the rear cupholder of the vehicle near the center console. The officer learned that Ms. Bell’s Illinois driver’s license was currently suspended. While conducting a search of the vehicle, police found one open can of Coors Light Beer and two pint bottles of vodka. At the Park Forest Police Department, Ms. Bell was escorted into a booking room by one of the officers. While conducting an inventory of her property, police discovered one unmarked pill bottle containing 11 white oval pills marked IBU 800 (800 milligrams ibuprofen) and one orange oval pills markedG32 (500 milligrams naproxen). Police also located a pill bottle prescribed to someone else containing 75 white oval pills marked t 150 (600 mg gabapentin), one unmarked pill bottle containing 11 white oval pills marked ZC38 (200 milligrams hydroxychloroquine sulfate), and one off-white pill marked LCI 1330 (10 mg baclofen). Police located other pills in an Altoid Mints container and another unmarked pill bottle containing more pills. Police also located a cut black plastic coffee straw containing an off white powder residue inside. An officer field-tested a recovered substance which tested negative for heroin but positive for the presumptive presence of methamphetamine and weighed approximately 0.4 grams. None of the pills recovered are listed as controlled substances. However, Ms. Bell did not have any prescriptions on hand for them. All recovered pills and methamphetamine were placed into evidence, according to police. Police were dispatched to the 500 block of Wildwood Drive on January 5 at 9:48 AM to investigate a report of criminal damage to property that had just occurred. The complainant said that the alleged offender had just damaged the complainant’s tires and a window of her vehicle. When police arrived, they found all four tires of the vehicle were flat in the driver’s rear cargo area window was shattered. Police have suspect information and are investigating. Shontel C. Holman, 49, 110 Lester Rd., Park Forest, was arrested on January 6 and charged with improper lane usage, failure to notify property damage from an accident, driving under the influence of alcohol, resisting/obstructing a peace officer, and battery. On January 5 at approximately 11:59 PM an officer was dispatched to the area of 400 Lakewood Boulevard in reference to a premise check. Communications advised that the complainant stated a vehicle possibly hit something in the roadway and continued going toward Western Avenue with sparks spraying out from under the vehicle. Communications additionally advised that a second vehicle then struck something as well and was stopped in traffic. When the responding officer arrived, he observed a black 2007 Hummer H3 in the single southbound lane with the front passenger side tire missing. The entire wheel assembly was completely gone, according to police. Police made contact with the driver and sole occupant of the vehicle, later identified as Shontel Holman. Police spoke with a witness who heard the crash and observed a vehicle driving away with sparks coming from the undercarriage. Police also located a light pole that had been knocked down. Ms. Homan told police that someone had run her off the road. An officer asked Ms. Holman how she got back onto the roadway to which she replied, “I’m not on the road.” The officer reassured Ms. Holman that she was on the road, she was on Orchard Drive. The officer asked Ms. Holman why her vehicle was missing a tire to which she replied, “the sidewalk,” and allegedly admitted to striking the curb. Ms. Holman did not recall striking the pole. Police detected the smell of an alcoholic beverage emanating from Ms. Holman’s breath, according to police. While transporting her to the Police Department, Ms. Holman continued to smell of alcohol, according to police. At the police station, Ms. Holman refused a breath test. An officer had to explain the next steps of the procedure several times, according to police. Ms. Holman was provided a copy of the Law Enforcement Sworn Report. Ms. Holman was placed in a holding cell and permitted to call her daughter. After this, she immediately fell asleep in the holding cell, according to police. Ms. Holman’s vehicle was towed, loose pieces of her Hummer picked up by the two truck driver.